Collecting emails for business promotion could be a seriously tedious task as far as seeing it as a legitimate way. There are plenty of software available to pull emails from HTML pages from various search engines. Sorting and using them wisely to retrieve emails for promotion is advised to carry out free email marketing program. Furthermore with this, hiding your own email address or keeping it away from spammers is a key to achieving the goal. People often think as email extracting software are spam and fake ways to built audience, but it is not true. Pulling hundreds of emails from online pages may sound completely bad idea but surely it will boost your online business through bulk invitations, reviews and subscribes requests if done correctly. You will personally need to sort all those useful emails which are needed for your promotion. Other good methods include sign up form on your home pages, call to action for newsletters - subscriptions - events - discounts, Instagram promotion, Twitter lead generation etc. But most of the time they freeze over a period of time and popularity grows slower. To tackle this and to create a strong continuous stream, site owners need to be updated database to fire up their advertising programs. Email extracting software exactly does the same. Many site developers prefer paid services to promote their websites and blogs however with little more personal efforts they can save money by using these tips. Here are some best email extracting software available online. Email Extractor - Emailextractorpro.com currently offers free email extracting software for trial with extraordinary results. If you wish to save all those emails, you need to register their product. It handles sources such as search engines, website pages, URL lists, email accounts etc. It scans online pages for keywords given by users and enlists the results. You can even search for a specific domain such as Google - Alabama, from select sources from top tabs. Extension to this software is Email Verifier - As the name suggests you can actually verify how many of those emails are genuine. Mass mailing is a crucial process and hence email verification becomes necessary. Sagawebs.com - This is widely used software from many of top tier site owners. It has a better ranking than others and has been used by thousands of people. They call it as "Acute Email IDs Production Engine". Site advice users to follow CAN-SPAM Act Guidelines so as to stay assured with their bulk promotions. Atomic Email Studio - One of the best choices in email marketing battle. It provides the best solution among most developed stages for pamphlet administration. SendBlaster - Yet another email extracting software which is on the list. Easy setup and works pretty well. 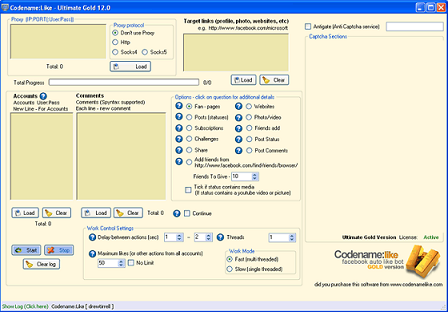 Atomic Email Hunter - (Atompark Software) It is capable of pulling email addresses and their usernames from site pages. 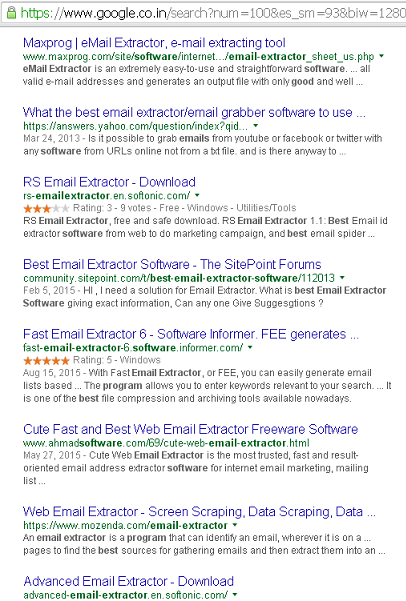 Web Email Extractor Pro - It safely collects emails from a Rundown of site's URLs. You can get ideal results by web indexing methods. Webmail Extractor Genius facilitates to use specific criteria to get more scrutinized results and not all mail address. eMail Spider from GSA - It provides the best country-specific search engines and comes with built-in email sender. It also extracts phone and fax numbers along with emails. It has better speed. eMail Extractor 14 - It has great features of skipping banned sites and sorting emails depending upon user parameters. Other paid software such as Codename like (latest gold version) are worth using as they promise 100% results. But danger also comes along as the process may not be so legitimate and you need to be cautious and need professional assistance to carry out the activity. There are plenty of online social sharing sites which have recently come up with the possibility to boost your fan following at low cost or with return sharing method. 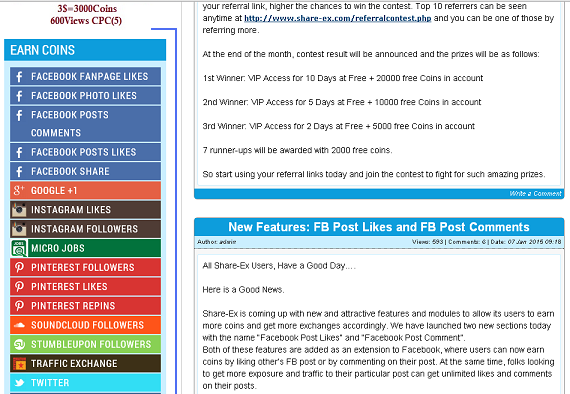 You can earn coins while liking others and with the same process, your pages will be liked. If you wish you can even invest a little bit of money to boost your sharing. e.g. share-ex.com see snapshot below. Note: All above software are mostly paid versions for downloading the email database. Still some of their older versions are freely available on download sites. You must surely avail them freely for your business promotions.